The homage will take place on April 12 as part of the commemorative activities organized in Barcelona to remember the proclamation of the second Spanish Republic and will include the third edition of the Memory Bus connecting the memory sites of Camp de la Bota and the former prison of Les Corts. Isabel Vicente was a textile worker at the factory of La Sedeta, in the neighborhood of Gràcia, Barcelona. She took part in the first clandestine network of the PSUC (Partit Socialista Unificat de Catalunya) once the Civil War ended. In 1940, at age 22, she was sentenced to twelve years in prison and entered the women’s jail of Les Corts, remaining there until 1947. Back to the antifrancoism activism, she was detained several times until her last entry to a prison, in 1958 – a pavilion enabled for women in La Model prison. 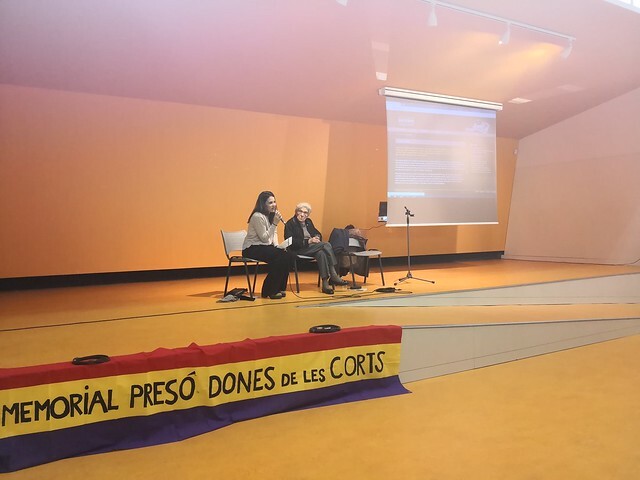 In 1968, Isabel Vicente participated in the foundation of the Prison Assistance Committee “Solidaridad”, and some years later in the Catalan Association of Former Poliitical Prisoners. In 1977, during the first general elections in Spain after dictatorship, she ran for the PSUC in the circumscription of Barcelona. Isabel Vicente died on March 21, 2000. L’homenatge comptarà amb la tercera edició del Bus Memòria, que sortirà del Camp de la Bota a les 15h30 amb parades a la Plaça de la República i a l’Espai de Memòria – Dones/Presó de Les Corts, finalitzant el recorregut a l’Escola l’Univers de Gràcia. Parada 1: Camp de la Bota (cantonada de l’Avinguda Diagonal amb la Rambla Prim). Parada 2: Plaça de la República. Espai Dones i Memòries a les Corts (cantonada dels c/ Joan Güell i Europa). Sortida cap a l’Escola l’Univers. Obrera tèxtil de la fàbrica de la Sedeta, al barri barceloní de Gràcia, Isabel Vicente va ingressar en la presó franquista de les Corts el febrer del 1940 juntament amb Maria González, Maria Domènech i les germanes Teresa i Maria Hernández. Tenia vint-i-dos anys i havia participat en la primera xarxa clandestina del PSUC una vegada acabada la guerra. Fou condemnada a dotze anys de presó i va romandre a les Corts fins el 1947.